Distracting or intrusive noise is a key source of workplace stress and lost productivity. Fortunately, the problem is often solved with the installation of a Soundmask system. increased errors and staff attrition. Distracting noise in the office adversely affects performance, mental workload and task completion rates. Distractions come from the sounds of typing, machines, laughter, conversations and colleagues walking past their cubicles within the workplace. Workers are forced to raise their voices or block their ears while on the telephone in order to compete with the surrounding cacophony. 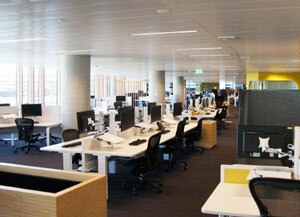 It is hardly surprising that a recent study by Dr Vinesh Oommen at the Institute of Health and Biomedical Innovation found that “in 90 per cent of research, the outcome of working in an open-plan office was seen as negative, with open-plan offices causing high levels of stress, conflict, high blood pressure, and a high staff turnover." In the context of a healthcare facility, noise like traffic, deliveries and sirens from outside and medical equipment, talking (staff, nurses), visitors, fellow patients, and general activities from inside can become worse than distracting for patients trying to recover. These sources of distracting noise have varying impacts on patients, however, studies show that staff conversation and alarms seem to be the most disturbing noises when patients try to sleep, leading to reduced sleep, recovery and wellbeing. A Soundmask system works by generating unobtrusive sound waves. This imperceptibly increases the level of background sound in the space, masking distracting noise like typing or chatter and ensuring that speech is unintelligible. The space itself appears quieter because distracting or intrusive noise and intelligible speech are masked. Further, Soundmask systems do not themselves become distracting because the generators that create the sound waves are programmed not to repeat for several lifetimes. A zoned Soundmask system was required at AMP Financial Services where the distracting noise from the lifts (above) was different to that in the open plan office and reception area. 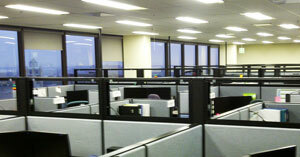 Open plan offices like the Hamilton Call Centre in Canada, pictured above, are the definition of an environment where distracting noise can decrease productivity and increase stress levels amongst workers. 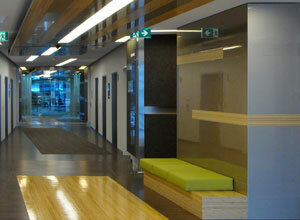 Green Star rated buildings like the Commonwealth Bank headquarters require the introduction of soundmasking due to the low level of background sound which makes distracting noise more prominent.